I have heard many cat owners say that their cat does not like to be held by their children and what are they to do? Children do not innately know how to properly hold a cat, recognize when the cat has had enough, or when to allow a cat "space and alone time". Here are a few suggestions on how to teach children how to hold a cat correctly and to improve your cat's patience as well. Preschool age and younger children often do not understand that squeezing or even hitting is uncomfortable or painful to others (including animals). Oftentimes, our pets deal with a young and exuberant child by staying out its way. If you see a cat trying to avoid a child, do not force the situation; a cat or dog that becomes scared or hurt will naturally try to escape which can involve using their teeth or claws. 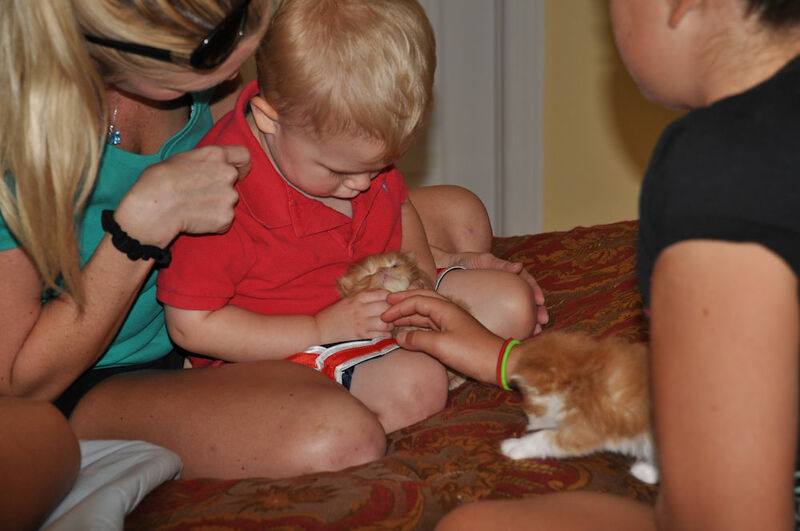 Teach a child to gently handle a pet by modeling the behavior on their own skin. While lightly stroking the child's arm and saying the word "gentle". Matching the word "gentle" to soft touching allows you to demonstrate to the child how to touch the family pet in the same way. You can have a discussion on proper handling of the cat with a school-age child; while younger children need to be shown. The next step is to slowly build up your cat's tolerance to petting and handling. While sitting down (with the child next to you), hold the cat on your lap and "help" your child pet the cat. Cats prefer to be scratched gently behind the ears, under the chin, and on the top side of the tail base. Show your child how it is to be done, have your child do it himself, and then praise both the child and the cat. By keeping a careful eye on your cat during this test petting, you can see if the cat becomes anxious (twitching tail is the earliest sign). If the cat shows signs of anxiety, let the cat leave. If the cat relaxes into the petting and handling, end the session on that high note. Under no circumstances should you punish your cat because you miss the warning that your cat is getting upset, that will only make matters worse and teach the cat to avoid human contact all together. Cats learn quickly and have very long memories! The next step is teaching the child to hold the cat properly. As indicated above, demonstrate the correct way to hold a cat; cradle the cat firmly but gently against your chest with an arm to support the hind end. I recommend sitting on the couch while performing this demonstration. Allow your cat to determine how long it wishes to be held and pay attention to anxiety. Constantly remind a young child to hold the cat gently because a panicked cat will fight to get loose. Take your cues from your child and the cat as to their comfort level and gradually extend the amount of time the child holds the cat and ALWAYS end a session before the cat wants to go (it is imperative that you watch your cat for signs of stress or anxiety). If your cat feels secure, he will extend the amount of time he will allow the child to hold him. Patience is the key as you are teaching new behaviors to both cat and child. How much cuddling a cat will tolerate depends on each cat's personality and comfort level with their owners and children. Some cats may never be as cuddly as a teddy bear, but you oftentimes can get the cat to at least relax in a child's arms long enough for them both to enjoy their time together.